Giving babies the recommended immunizations by age 2 is the best way for parents to protect their babies against 14 vaccine-preventable diseases. New parents are so busy that things can easily fall through the cracks and be forgotten. The Florida Department of Health in Broward County offers a FREE voluntary vaccine reminder program for parents of babies under 2 years old. Parents can sign up to receive a series of postcards, as reminders that their babies are due for vaccinations. During a baby's first two years, the program mails seven colorful "birthday" cards with pictures of stuffed animals and the message, "It's Time to Immunize." 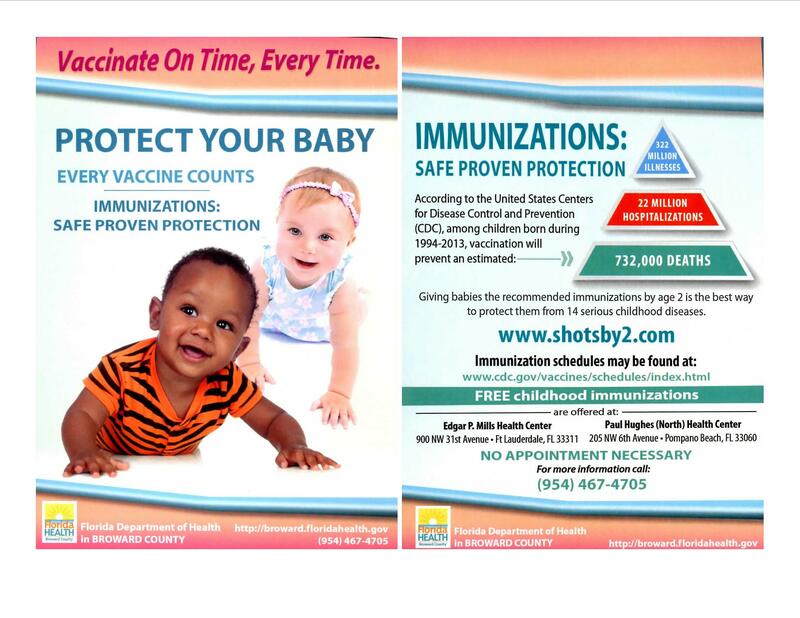 Parents are encouraged to bring their babies to their health care provider or a DOH-Broward clinic for vaccines. Please click on the parent consent form below in order to have the Immunization Outreach Program send you the reminders. For questions or more details, call (954) 847-8025.